Most of you know that I help with Cake distribution and if you didn’t, you know now. For those of you who purchased the Hummingbird pattern during the pre-sale, you’ll be receiving your pattern in a brightly colored envelope. The color of your envelope will decide your House for the sew-along. Check out the Flickr group, the home of the Hummingbird sewalong. It’s a way to build camaraderie among a large group of people. I know how many Hummingbird patterns I sent to the U.S. and Canada- and that doesn’t include those of you in UK and EU as well as the southern hemisphere peeps. There’s a lot of you. You should still feel free to comment and connect with people from other houses. In the end, this is for fun. How am I involved during this sewalong? I’m head of the Anna House- the pink hummingbird, of course. You don’t have to make everything pink in the Anna House, don’t worry. I’ll be there for support and fitting help alongside StephC and the other House heads- an awesome group of women. But isn’t the Anna hummingbird beautiful? So, that’s our badge. So, if you get a pink envelope, head on over to the Flickr group (click on the Anna hummingbird to go to Flickr) and say hi. 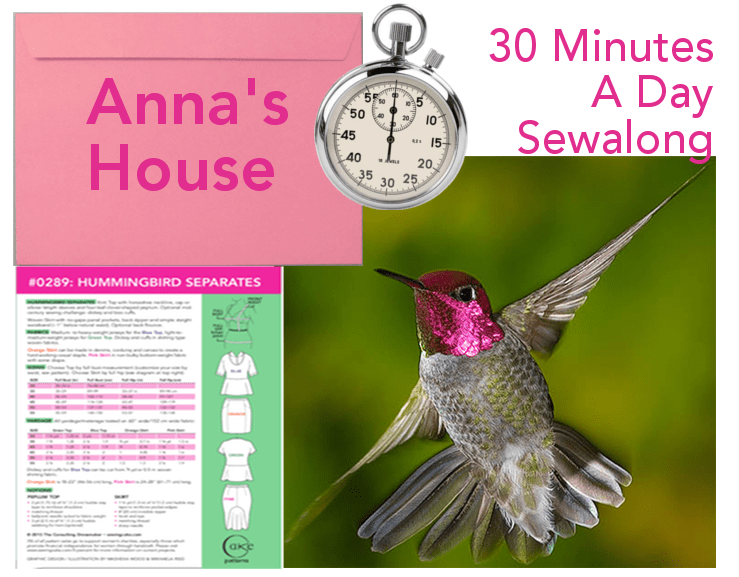 Don’t miss StephC’s Welcome where she also tells you what you could win: The House that completes the greatest number of Hummingbird Separates during the sewalong gets a gift code for $10 off their next Cake Patterns purchase. To each her own ability- this isn’t about stress and competition, but about encouraging one another to complete our projects in the spirit of collaboration. There are some rules so please do read thru it. The Sewalong goes from June 17-27 and yes it will overlap with the SwimAlong I’m doing but I’ll mostly be chatting about Hummingbird in the Flickr Group. Can you still join in the sewalong? You can sew along but I’m sorry to say you can’t enter to win the $10 off Cake patterns. That’s a perk for the people who purchased during the pre-sale. Don’t worry. There will be more pre-sales and honestly, you should jump in on that cos you get a discount for ordering during that time frame. It’s win-win. You can still purchase a Hummingbird pattern (they are currently in stock) on Etsy as a paper pattern or PDF download, on Pattern Review as a paper pattern only or on Craftsy as a PDF only. Oh, this looks like such fun! I was going to purchase the Hummingbird, but now will be too late (why do things take so long to get to my country??). Well, I will still follow along the sewalong so that I will know how to make the Hummingbird for when I do order it! Did you tell me you don’t like downloading patterns? Cos you can get it as the download. I downloaded the skirt pattern. It’s not a huge paper eater. Oooh, maybe I will get the skirt pattern then. It is on Craftsy? That’s where I downloaded the pockets. Yeah, you can get it on Craftsy! I bought it in pre-sale but still haven’t got it. Very nervous as I would love to be in your house! Hope it’s there when I get back from hospital!! I hope you’re in my house, too! All the UK/EU pre-sale patterns were sent by the printer in UK. Let me know when you get it..or conversely, if you don’t get it within another week. How long does stuff take from UK to Belgium usually? Steph won’t start the sewalong until everyone has their patterns. She’s still waiting to get the patterns from Australian customs. You are such a busy bee, I don’t know how you do it all! hehe, I don’t know either.